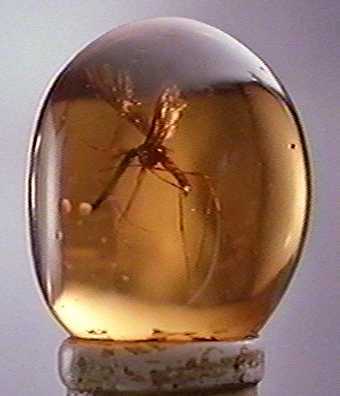 The picture shows an insect which became trapped in amber. Amber starts as resin from a tree, much like the sticky stuff on Christmas trees. If a blob of resin gets buried, and is never overheated, then it can come down to the present day as fossil amber. The occasional extremely small creature gets entangled in resin just as the tree is exuding more. We have several fossilized feathers, and at least one very small frog, and a whole bunch of bits of bark. Sadly, no T. Rex's. Fossilized insects are rare. More than half of the millions of species alive today are insects. But, of the 250,000 species known from fossils, only 8,000 are insects. Up to the what are fossils page.